Tom R. Chambers is currently Teacher in Technology Applications for Raul Yzaguirre School For Success [charter] in Houston, Texas, U.S.A. He also teaches and advises after school programming ["Power Time"] in Digital Photography and Digital/New Media Art. His core group of "Power Time" students have connected with the Houston Audubon Society [HAS] to make photographs, and exhibit their work at the HAS Annual Gala, Houston Museum of Natural Science [November 8, 2007 and March 5, 2009] and "Festival on the Bayou" [May 8, 2010]. They have also connected with FotoFest International [Houston] to participate in the organization's Literacy Through Photography [LTP] program as a project via a photo blog. The blog has been exhibited at FotoFest's "FotoFence 2008" [May 11, 2008], "FotoFence 2009" [May 17, 2009] and "FotoFence 2010" [May 9, 2010]. Chambers' regular classes [7th and 8th, 2008-2009] have shown their Digital Art [based on vocabulary building], DA_7_8_RYSS at East End Gallery, Houston Institute for Culture [January 7 - March 15, 2009], 4th annual Carnival of e-Creativity & Change-agents Conclave [2009 CeC & CaC], Sattal Estate, Bhimtal, India [February 27 - March 1, 2009], Talento Bilingue de Houston [August 3 - October 29, 2009], Lobby Gallery, Bob Lanier Public Works Building, City of Houston [November 6, 2009 - April 25, 2010] and City Council Lobby Gallery, City Hall [Cultural Affairs, Mayor's Office], City of Houston [April 26 - May 17, 2010]. A core group of his 7th Grade students made East End [Houston] history by traveling to Crespo Elementary Fine Arts Magnet School to mentor 26 fifth grade students in the use of graphics software to create Digital Art [January 13, 2010]; and all of his 7th Grade students connected with The Paul Revere House Museum, Boston to create Digital Art based on Paul Revere and the American Revolution [2009-2010]. Many of Chambers' Technology Applications lesson plans have been accepted as a part of the National Lesson Plan Library at Digital Wish [student projects]. Chambers was Visiting Lecturer in Digital/New Media Art for the Fine Arts Department at Zhaoqing University, Zhaoqing, China, 2005 - 2007. He joined the Department to develop and teach a Digital/New Media Art Program. He and his students collaborated with Beijing Film Academy (Beijing, China), Art Institute of Boston (Boston, Massachusetts, U.S.A.), Maine College of Art (Portland, Maine, U.S.A.), Rensselaer Polytechnic Institute (Troy, New York, U.S.A.), National Chengchi University (Taipei, Taiwan), Wake Forest University (Winston-Salem, North Carolina, U.S.A.) and University of Louisville (Louisville, Kentucky, U.S.A.) in joint student projects/exhibitions, off- and on-line. He was invited by the National Institute of Design [NID] in Ahmedabad, India to conduct a three-week, New Media Art workshop for its New Media Design graduate students, July 10 - 28, 2006. The workshop culminated in the exhibition, NMA@NID. He also exhibited his work, Kites for Gandhi along with the students' works. Chambers was Executive Committee Member and Juror (2003 - 2005) for the International Digital Art Awards (IDAA). He was instrumental in expanding the content of the IDAA to include New Media Art, and served as on-line New Media Director (2004 - 2005). He was also instrumental in helping to bring the 2005 IDAA Exhibition to Beijing, China under the auspices of the Beijing Film Academy. 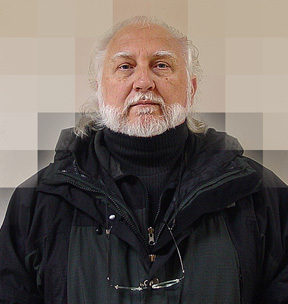 He was invited by the Fine Arts Department, New Media Art, Beijing Film Academy, Beijing, China, April 8, 2005 to give a retrospective lecture, Dyer Street Portraiture to Pixelscapes. This thirty-year retrospective took a look at Chambers' evolution from conventional documentary photography to his current work with digital and new media art. Chambers has been a Documentary Photographer/Visual Artist for over thirty years, and he is currently working with the pixel as Minimal Art (Pixelscapes). His Pixelscapes have been exhibited at the Novobirisk State Art Museum (Russia, [2005, 2006, 2007]), Zhaoqing University (China, 2007), IDAA exhibitions (Juror invitation) (Australia, 2003 - 2005), Glass Membrane: Scanner to Screen group show at the Digital Studio, UCR/California Museum of Photography (USA, 2002), Digital Showcase 15, Austin Museum of Digital Art (USA, 2002) and 6th International Information Visualization Conference, University of London (England, 2002). He has over eighty exhibitions, off- and on-line, to his credit. He is on the Faculty for Photo-Seminars.com. His documentary portraiture lesson is featured at this site, Profotos.com and others. He has also organized and curated two hyperlinked photo exhibitions for the PhotoForum membership under the auspices of the Rochester Institute of Technology (RIT), New York, U.S.A. As he becomes more and more involved with digital generation as an art form, he continues to pick up his well-worn Nikon FE2s to generate conventional documentary projects. He exhibited his work as a part of a two-person show, Zhao/Chambers Joint Photo Exhibition (The People of Longhu Town: a series of documentary portraits of the Chinese people), at the Library Gallery, Sheng Da College, Zhengzhou, China, 2004. He exhibited his work as a part of a two-person show, People To People (a series of documentary portraits of the Korean people), at Kumho Art Center, Kwangju, South Korea (1997); and this coverage was accepted as a part of the Kumho Art Foundation Archives Permanent Collection. He completed a three-year tour (1993-1995) as a United States Peace Corps Volunteer in Harare, Zimbabwe, Africa as Art Conservator/Curator for the National Gallery of Zimbabwe and as the Initiator/Instructor of The McEwen Photographic Studio for the National Gallery Art School: research/classification and computerization of the National Gallery Permanent Collection information; and instruction of a fine arts/documentary photography workshop for Black Africans (exhibitions held of the students works: 'Moments In Time' (1993), 'Moments In Time II' (1994) and 'Moments In Time III' (1995) at the National Gallery). He was invited by the National Gallery of Zimbabwe to exhibit Variations On The Dan Mask (a conceptual look at the African Traditional mask form through manipulation of the photogram technique) (December 1995; officially opened by the U.S. Ambassador to Zimbabwe); and he received a U.S. Government Grant via the United States Information Service (USIS), Harare to exhibit Southwest Of Rusape: The Mucharambeyi Connection (a series of documentary portraits of the Black Zimbabwean people) at the USIS Gallery (June-July 1995; officially opened by the U.S. Ambassador to Zimbabwe; and accepted as a part of the USIS Archives Permanent Collection). He has exhibited his fine arts/documentary work throughout the U.S.A. (over thirty exhibitions), and his mixed media/interactive work, Mother's 45s (a tribute to his mother through a combination of her 45rpm records, family photographs and sound [music from the records]), was selected through national competition for exhibition as a part of the Parents show at the Museum of Contemporary Art, Wright State University, Dayton, Ohio, U.S.A. (1992). American Photo magazine listed one of his documentary projects, Dyer Street Portraiture (a look at the culture mix on a particular military street in El Paso, Texas, U.S.A.), in its March, 1986 issue. His documentary project, Descendants 350 (a look at Rhode Island (U.S.A.) early history through a combination of portraits of Descendants of the Founding Fathers and historical text), was shown throughout Rhode Island (ten sites) and accepted by the Secretary of State (Rhode Island) as a part of the Rhode Island State Archives Permanent Collection (1990) (received a Governor's [Rhode Island] Proclamation); and his documentary project, In Black And White (a look at Black culture and influence in Rhode Island) was shown and accepted as a part of the Rhode Island Black Heritage Society Permanent Collection (Providence, Rhode Island, U.S.A.) (1989). He founded and directed a not-for-profit, photographic arts organization and gallery, Viewpoint, Lubbock, Texas, U.S.A. (American Photo magazine reviewed one of the exhibitions at the gallery in its April, 1983 issue) (1982-1983); and founded and directed a not-for-profit, photographic arts organization, Photoreach, Providence, Rhode Island, U.S.A. (1990). He was listed (1984-1991) in the Artists-In-Education roster with the Rhode Island State Council for the Arts (RISCA) (U.S.A.), and served as an Advisory Panelist for RISCA to determine funding for residency programs. He also served as an Advisory Panelist for the State of Connecticut Commission on the Arts (U.S.A.) to determine funding for residency programs. He provided documentation of the homeless and poor in Rhode Island (U.S.A.) for the Rhode Island Food Bank (1986); provided documentation of the elderly in Rhode Island (U.S.A.) for Brown University (Providence, Rhode Island, U.S.A.) and the Andrus Foundation/American Association for Retired Persons (1987); and provided documentation of city life and politics for the Executive Office of the Mayor, Providence, Rhode Island, U.S.A. (also for the Rhode Island Delegation at the Democratic National Convention, Atlanta, Georgia, U.S.A. - 1988), which culminated in the exhibition, Hot City, at the Rhode Island Hospital Trust National Bank, Providence, Rhode Island, U.S.A. (1989) (1985-1990) (received a grant and Mayor's Proclamation). He conducted Polaroid workshops for at-risk, inner-city youth in Providence, Rhode Island, U.S.A. for Metro Arts (grants from the Polaroid Foundation); and served as an Advisory Panelist for the organization (1986-1990). And he produced and directed visual arts/performance arts presentations, VP90 (Release) and 'CYSX2' as a part of First Night Providence, Providence, Rhode Island, U.S.A. (1989-1991). News articles about Chambers' projects.